Shared Knowledge Awareness is defined as the consciousness on the shared knowledge that a particular student has when carrying out a collaborative learning activity in a CSCL environment. In fact, an adequate level of Shared Knowedge Awareness can be promoted by including in the interface of this environment some specific features that improve the student perception related to such knowedge. 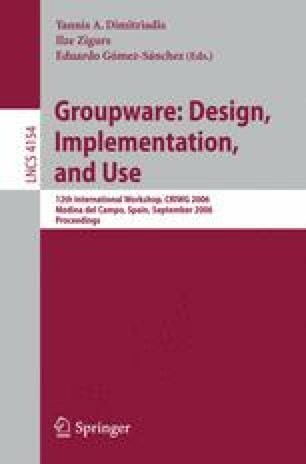 This paper proposes some basic design guidelines that should be taken into account when designing a CSCL interface in order to promote an adecuate user’s behavior with respect to his/her Shared Knowledge Awareness. Besides, a set of usability principles is identified and linked to every suggested guideline to evaluate its quality (in terms of “easiness to use and learnability”) in an actual interface. Two different experiments are included as real-life examples that are analized within the proposed approach.